An Executive Summary of Safety and Productivity Improvements in Bridge Cranes. In a comparative study performed by the Rochester Institute of Technology, this paper reports the Force Requirements and Productivity for I-Beam and Gorbel® Work Station Overhead Bridge Cranes. 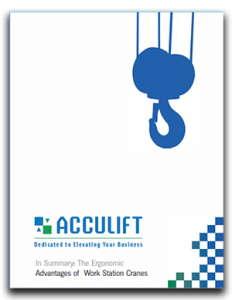 > Download the Whitepaper on Workstation Cranes Ergonomic Study here. A Summary based on a study performed by the Rochester Institute of Technology. This study compared the performance of Gorbel’s G-Force® Intelligent Lifting Device to various lifting methods.